The white Cmple 18 AWG CL2 Rated 2-Conductor Loud Speaker Cable for In Wall Installation is a 100' long cable that delivers high fidelity, wide frequency range and low signal loss. This cable is capable of delivering loud, clear and crisp audio reproduction. This cable has a white outer jacket to blend in with your walls and baseboards for out of wall applications. This speaker cable is CL2 rated to meet most building codes for in-wall installation. This cable comes wrapped in a PVC (Polyvinyl Chloride) jacket, built to withstand high levels of stress, pulling, and pushing. 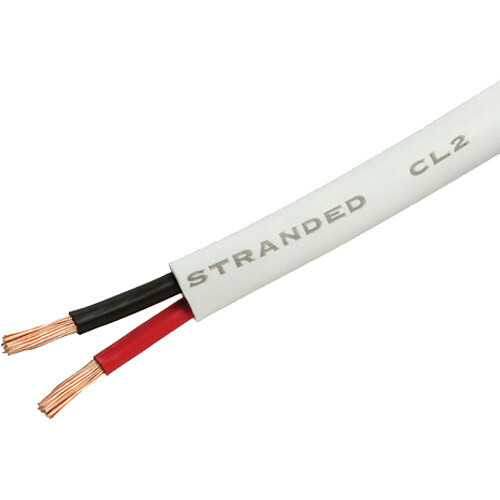 CL2 rated speaker wires are made of the heat resistant material which makes them the one of the safest and permitted option for in-wall installations. Designed for flexible, simple installations, this speaker cable is great for most installations where cable runs require several bends and twists in the line. Since bulk cable is generally used in intervals, the spool that it comes in is reinforced to provide great protection and is made with a simple design to keep your bulk cable free of kinks and knots while being pulled from the spool. Box Dimensions (LxWxH) 7.0 x 7.0 x 3.5"